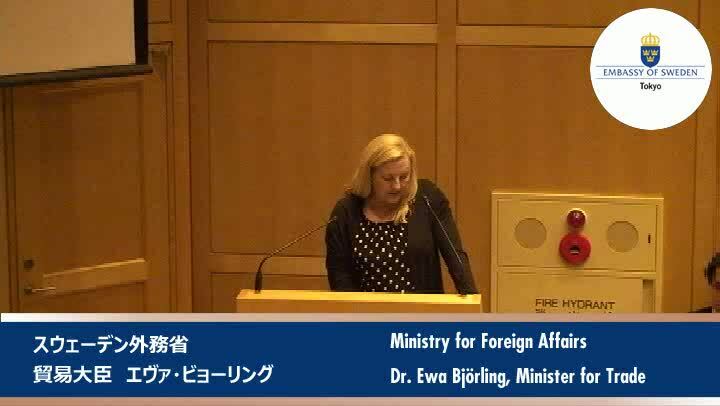 How on earth can the Swedish Minister of Trade on visit in Tokyo be seen and heard all over the world, with simultaneous translation into Japanese? Of course there is a lot of complex technology being used. But also some smart planning and cheap tricks. Here is part of the story behind an interesting case. The Tokyo branch of INVEST SWEDEN assist Japanese companies who are considering a new establishment or an expansion of its business in Sweden, or in the Northern Europe Market with Sweden as a base. 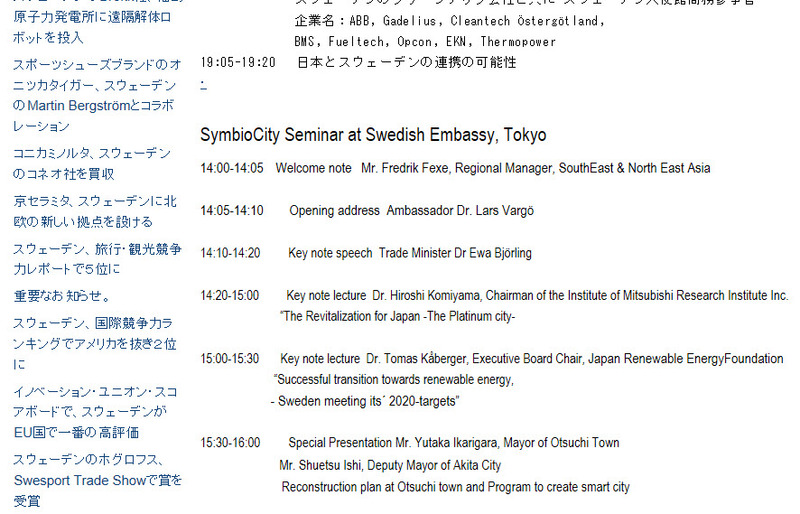 Invest Sweden organize many interesting seminars, of which some take place at the Swedish Embassy in Tokyo. In September 2011 Johan Ronnestam visited Japan, including the Swedish Embassy (as evident on for example Flickr). There he met Martin Koos (@mkoos), who wanted to improve the way he was livestreaming different seminars. So, via e-mail Johan on the spot introduced me to Martin. Least to say Martin Koos is on a very limited budget for this kind of activites. Early in the fall of 2011 we discussed different possibilities over e-mail and Skype. It’s kind of cool to have a breakfast table video conference at home with the Swedish embassy in Tokyo :). More recently, as January 2012 was coming to its end, Martin contacted me again for some last minute questions. He had purchased a new powerful laptop, a camera, and some other gear. The question now was how to put all this together, with a decent aestethical appeal and powerpoint integration. Invest Sweden wanted to premiere their new livestreaming style today, during the SymbioCity Seminar at Swedish Embassy. Among the speakers were Sweden’s Minister for Trade Ewa Björling who visits Japan to showcase Swedish solutions for sustainable cities, along with Swedish food and music. I recommended Martin which version of VidBlaster to use, and to purchase some additional devices and cables that would allow him to integrate the screen projections into the live stream. As the seminar was being translated into Japanese, he was simply going to connect one of the wireless translation receivers to his production laptop. I warned Martin that because such receivers are typically mono channel devices, he might be sending audio in only one of the channels. A mono to stereo adapter could fix that. Last Friday, while commuting to work early in the morning, I got an e-mail from Martin which started: “Good morning, I am in Akihabara and have found everything except the audio adapter. Please advice…”. We connected over Skype and I tried to describe how he instead could connect a few common cables. But it was hard to explain orally. While entering the store of Lindqvist Radio TV (where I was purchasing some cards for another customer of Westreamu), I borrowed pen and paper to make a drawing. When done I grabbed my mobile, took a picture, and e-mailed it to Martin. That did the trick! But a little bit later I realised that the Edirol M-10MX mixer would be better solution. And of course Martin immediately found one at Akihabara. Today was the big day, and it all went very well, as you can see here in the embedded version of the archived livecast from the SymbioCity seminar. All in all I am deeply impressed by how Martin Koos managed to put all this together. If you have ever been close to putting up a multiple camera live production with graphics and web integration, you know how complicated it is. As far as I can tell everything went the way it was supposed to go. Specify the time zone. When you livestream you potentially reach a global audience. Tokyo is 8 hours ahead of Stockholm. Therefore, announcements and information about times (e.g. an overlay stating “Seminar will continue at 16.00”) needs a longitudinal reference (e.g. “… at 16.00 JST”). For more info about local times, see for example Timeanddate.com. Alwas consider the post live linking. Martin chose to set up a live page at http://www.investsweden.se/live. A good choice (for a discussion about that, and alternatives, see Samla er webbtv på en sida (in Swedish). Their live page is mainly in Japanese, with the schedule spelled out in English too. I wanted to link to that schedule, as it also specifies speaker names and the contents of the presentations. Unfortunately that url (http://www.investsweden.se/live#english) will most likely lead to something else next time Invest Sweden goes live. Therefore, always prepare for some kind of documentation page, with a unique url.